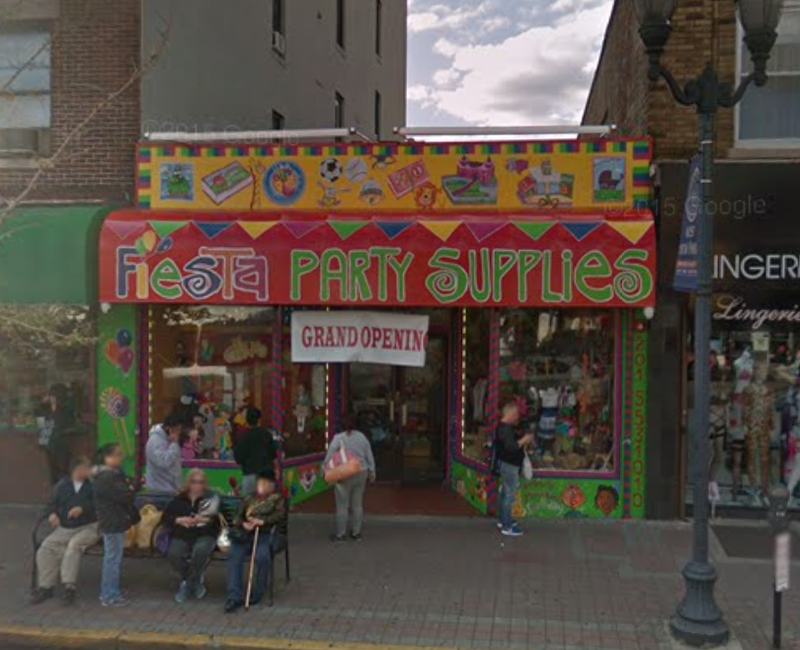 We're hopping directly across Bergenline Ave from Four Seasons to check out the independent Fiesta Supermarket. 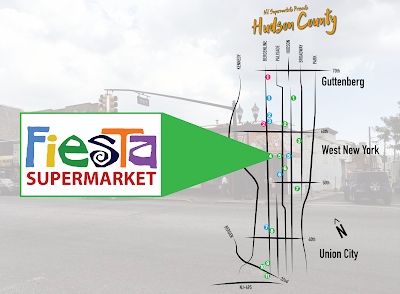 Fiesta was formerly an IGA but is now affiliated with the Retail Grocers Group. The same owners, as I mentioned briefly in the Four Seasons post, own the Fiesta Party Supplies (kind of a Panera Bread or ATM machine situation there! 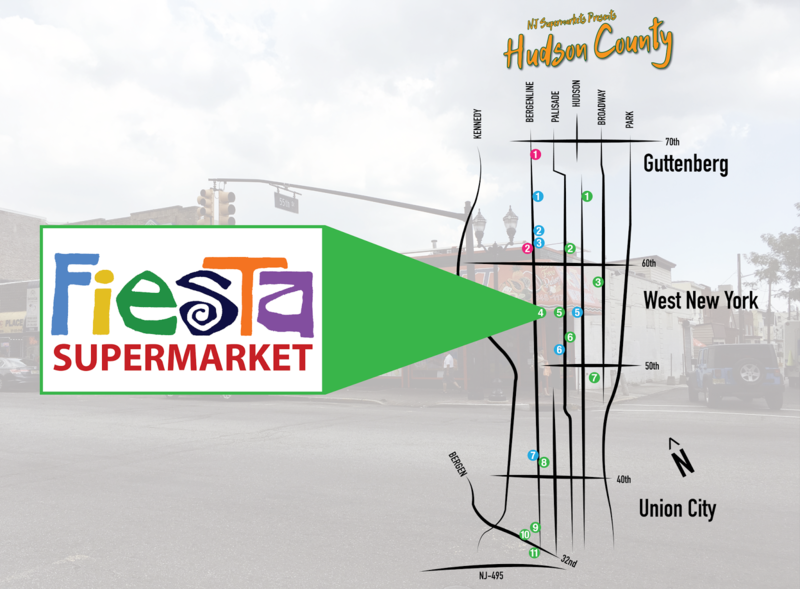 ), and the Frutería Fiesta just south of 56th St. Image from my August 2017 visit (yesterday's Bonus Snapshot). The Fruteria is an interesting store, with a selection of produce and a small deli with a juice bar. Since it's only about a block away from Fiesta Supermarket, they probably try to prevent as much overlap as possible. The Supermarket doesn't have a juice bar, but they do have produce and a deli. Another hand-painted awning. A very nice touch that makes it a more personal experience. Close-up on the graphics on the awning. It looks like the building has been painted fairly recently on the front, but the side is still an older white. Notice also the bricked-over windows. Hard to tell if this is a longtime supermarket or if it's a converted building. Maybe a local can give us some input. Here we're looking down the front-end, which lines Bergenline. Produce lines 55th (to my right here). The meat department lines the back wall. Everything you'd need for a party: fruit cocktail, limes, and soda. 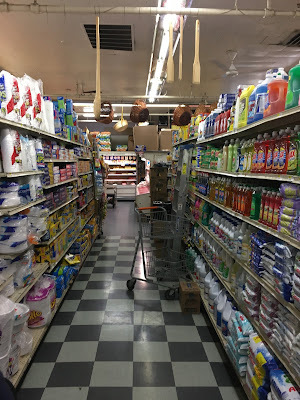 The stuff hanging from the ceiling (in different parts, there were baskets, piñatas, flags) certainly makes the store feel festive, but it also exacerbates the busy and cramped store's space problems. At least it definitely makes the place feel much more cluttered than it is. More hand-painted signage on the back wall of the store. The butcher counter was quite impressive here. This store makes use of every inch of space they have, which does allow them to pack a crazy amount of merchandise into the tiny building, but sure makes for a cramped experience. It's also a very popular store. 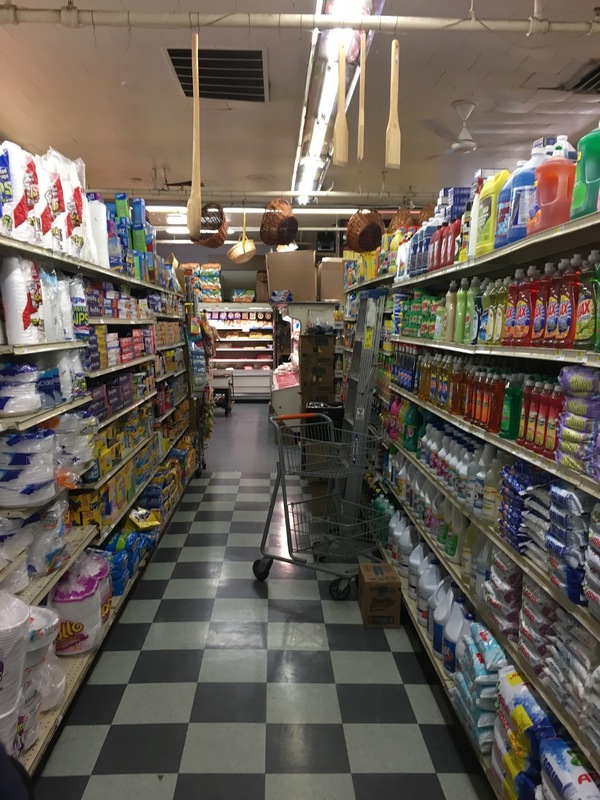 A look down the nonfoods aisle. I still don't know why so many supermarkets sell huge selections of paper goods, dish detergent, laundry products, soap, but no HABA. Not enough turnover? Risk of shoplifting? Any input is welcomed! Small selection of packaged meats continues past the butcher counter, but the service counter is obviously the focus. Don't try to pass with two carts here! The meat cases turn into cold cuts, then dairy along the side wall to the left here. All the fixtures are quite old. Dairy takes up half of the last aisle, with frozen on the other half. Notice the floor is that rubber utility floor -- interesting choice. I'd love to know how this cart, being used for returns or overstock, got to Fiesta. Although D'Agostino never had any stores in New Jersey, they did attempt to buy Kings Food Markets, but failed. One last thing before we head out is this bulk food case. The first store I visited that day was Fine Fare at 33rd Street, which had one. I thought, "Cool! That's a unique feature for this store!" Then I went to Despensa del Ahorro, which had one. Then City Fresh, which had one. By the end of the day, I would be surprised if I walked into a store that didn't have one of these cases. Fiesta was an interesting spot. Definitely good use of space, but maybe they're trying to pack in too much. I liked the painted graphics, but I wish the store were just slightly cleaner. Kind of feels like no one cleaned up after the fiesta last night.